SolarClarity won recent years a number of prestigious awards. Thus, the company received in 2013 a Golden FD Gazelle Award from the Financial Times and was nominated for Entrepreneur of the Year for the province of North Holland. In 2014 SolarClarity even proclaimed ‘National Champion’ to represent the Netherlands at the European Business Awards. Since 2011, the company may also be the logo “Financial Health” by rating agency Graydon conduct. Solarclarity, a leading international PV wholesaler, announces that it has been awarded the premium EuPD Research 2016 TOP BRAND PV SEAL of approval for its commendable brand management and brand awareness among installers in the Netherlands. Each year EuPD Research conducts Europe-wide surveys and prepares an independent evaluation on how brands systematically develop, how they differentiate form competitors and how appealing they are in the eyes of PV installers. Being awarded a TOP BRAND PV SEAL, as the first wholesaler in the Netherlands, highlights Solarclarity’s original, specific signature and it’s broad product portfolio that prevails over competition. The TOP BRAND PV award has been issued to PV wholesalers for several years now, distinguishing those that score above average in comparison to their competitors. However, it has been the first time this award has been provided to a Dutch wholesaler. “The satisfaction of installers with our brand and product portfolio underlines the high quality and service that we would like to guarantee to our customers. The award is an additional incentive for us to continue fulfilling the market specific expectations and needs of our installers in the future, “said Peter Desmet, CEO Solarclarity. SolarClarity won the Golden FD Gazelle in sales of medium class: 2-30 million. November 27, 2013 the award for North Holland was presented during a ceremony at KPMG’s headquarters in Amstelveen. SolarClarity more than sevenfold her sales in the last 3 years, and is the fastest growing company in North Holland in its revenue class. 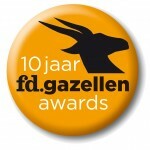 To qualify for FD Gazelle Award a company must achieve within three years revenue growth of at least 20%, achieving a positive net result and financially health. The European Business Awards is an independent awards program designed to recognize excellence, entrepreneurship and innovation in European industry and encourage. With the nomination as ‘National Champion’ SolarClarity is one of Europe’s most dynamic companies. The prestigious EBA election is supported by business leaders, academics, media and politicians from across Europe. Important criteria are the pillars: financial growth, innovation, entrepreneurship and international orientation. In 2013 SolarClarity was nominated for the Enterprise Election North Holland ‘in the category SME Center. ‘Best Company of North-Holland’ is the recognition for entrepreneurship in the province of North Holland. Since 2011 SolarClarity may also carry the logo ‘financial health’ of rating agency Graydon.